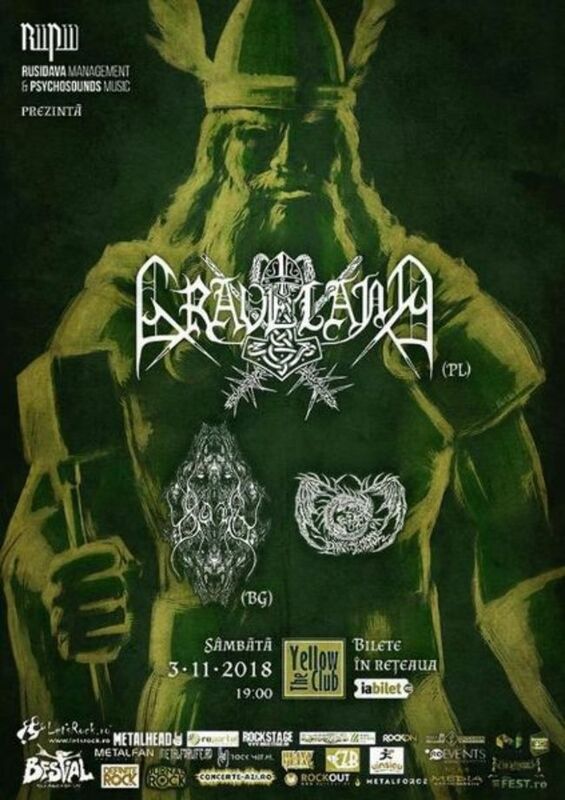 GRAVELAND, legendara trupa poloneza, va concerta pentru prima data in Romania in data de 3 noiembrie 2018. In deschidere vom avea 2 trupe : BOLG (BG) si DARK AECLIPSE (RO). Graveland is a Polish pagan metal band which was formed in 1992 by Rob Darken. It began as a black metal band, before adopting a pagan and Viking metal style. The lyrics and imagery of Graveland are strongly inspired by European mythology, nature, winter and war. Their early work focused on Celtic and Slavic mythology, while their later work focuses on Norse mythology and Wotanism. Un eveniment "Rusidava Management & Psychosounds Music", beneficiind de gazduirea calduroasa a "Yellow Club". Biletele se gasesc pe www.iabilet.ro si in reteaua iabilet.ro/retea : Magazinele Flanco, Metrou Unirii 1 langa casa de bilete Metrorex, Magazinul Muzica, Magazinele IQ BOX - Telekom, Cafe Deko, Club Vintage, Club Quantic, Hard Rock Cafe, Beraria H, Expirat Halele Carol (18-22h), Agentiile Perfect Tour, Magazinele Uman, pe terminalele ZebraPay si pe aplicatiile de IOS si Android iaBilet.